Can Midnight find what was lost? This novella is a great peek into the psyche of Midnight, letting us understand more about the legendary man who lived, worked, and fought with and against metahumans. Midnight is still searching for the device he used against Jones during the Battle, but lost in the mayhem. 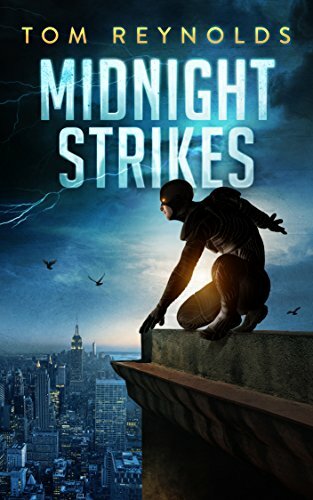 Midnight Strikes is action-packed and does a lot of character building and fills in background mythology to the world of metahumans. Midnight comes up against an organization that promises metahumans that they will regain their powers, that their bands still work. It’s a cult that pulls in the friend of Midnight’s new acquaintance, Amanda, also a former metahuman, who’ll do anything to get her back. What’s happening to the missing metahumans? Can Midnight divine the Receptive’s true motives, free Amanda’s friend, and locate the mysterious device that he lost? Fun, fast, and unique. Worth the read.